Demonstration of a positive effect of GH administration on bone density in adults with childhood-onset GHD cannot be assumed to be applicable to patients who acquired GH deficiency as adults. It is unknown whether the abnormal course of skeletal maturation and the potential failure to reach peak bone mass despite GH therapy in patients with childhood-onset GHD may enhance the subsequent response of such patients to GH administered in adulthood. Observations in patients with acromegaly, a condition in which the bones are exposed to high levels of GH in adulthood, provide some indication that GH may increase bone density in adults who develop normally. Two studies of patients with active acromegaly have shown increased bone density in the forearm (40), femoral neck, and Ward's tri angle (41) compared to normals. This was not found in patients with a history of treated acromegaly who had normal levels of IGF-1 (40). Interestingly, acromegalic patients who were simultaneously hypogonadal, displayed diminished spinal bone density despite the increase in cortical bone density (40). Studies of GH administration in patients with adult-onset GHD have shown results consistent with those in childhood-onset patients. Initial short-term studies have shown GH-induced increases in bone turnover, while subsequent longer-term, often noncontrolled studies have demonstrated improvements in bone density. Bengtsson and coworkers have published three studies of GH administration in patients with adult-onset GHD that have included evaluations of bone turnover markers and bone density. The first of these involved 10 patients and demonstrated GH-induced increases in osteocalcin and the aminoterminal propeptide of type 3 procollagen within 6 wk with further increases noted at 6 mo (42). A subsequent study by this group involved 25 patients who participated in a 6 mo, placebo-controlled trial of GH administration, followed by an open-label trial for a total of 12 mo of GH treatment in 12 of the patients (43). At 6 mo, significant increases in bone formation markers were seen, however, total body bone mineral density as measured by dual-energy X-ray absorptiometry decreased 2.1%. In the 12 patients who continued in the open-label phase of the study, total body bone mineral density remained slightly decreased compared to baseline, though a significant increase was seen in bone density of the femoral neck. The majority of the patients studied required reductions from the GH dose of 0.25 IU/kg/wk owing to symptoms of carpal tunnel syndrome and edema. The group's third study, an open-label trial, was larger and longer than the previous efforts (44 patients studied for 2 yr), and included downward dose adjustments in GH dose for patients with elevated levels of IGF-1 (44). Despite the dose reduction protocol, 24 patients had elevated levels of IGF-1 at the conclusion of the study. Bone density measurements of the lumbar spine, femoral neck, greater trochanter, and Ward's triangle were increased at 18 mo compared to baseline and increased further at 2 yr for a total 3.8-5.6% increase over the entire study. Two shorter randomized studies of GH administration in patients with adult-onset GHD have shown the expected increases in markers of bone without improvement in bone density after six (45) or 12 (46) mo of GH administration. The longer of the two studies showed a small but significant decrease in bone density of the whole body and the forearm in patients receiving GH (45). Both studies employed doses of GH that frequently produced side effects. Another such study found no increase in bone density despite a total of 12 mo of GH administration to 13 patients in an open label extension of a 6-mo randomized study (47). 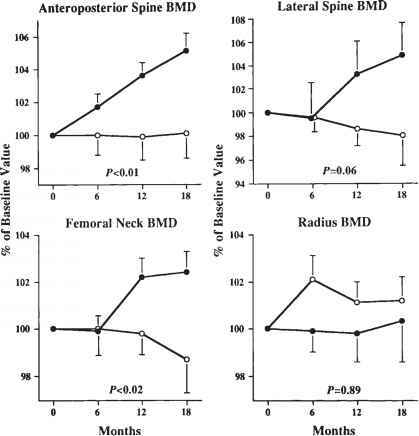 We performed an 18-mo, placebo-controlled study of GH administration in 32 men with adult-onset GH deficiency and demonstrated a positive effect of GH on bone density of the lumbar spine (5.1% increase) and femoral neck (2.4% increase) over 18 mo with associated increases in markers of bone turnover (see Fig. 2) (48). This study employed a starting dose of GH lower than that of the earlier studies (10 mcg/kg, approx 0.03 IU/kg), with dose adjustments that avoided supranormal IGF-1 levels in the majority of patients. 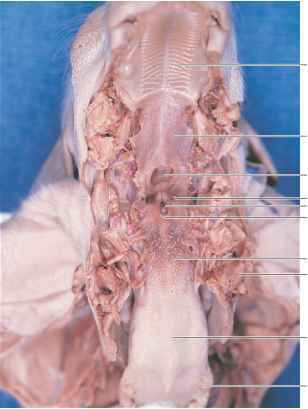 These data indicate that physiologic replacement of GH can increase bone mass in this population. In addition, benefits were achieved with a much lower rate of side effects. As with childhood-onset GHD, studies of GH administration in adult-onset GHD have consistently demonstrated increases in bone turnover, but not always increases in bone density. Only one controlled study has shown a benefit of GH on bone density, so that further studies are necessary to confirm this effect. Fig. 2. Bone mineral density of the lumbar spine measured in the antero-posterior projection, lumbar spine measured in the lateral projection, femoral neck, and one-third distal radius in patients with GHD receiving GH (•) or placebo (O). Values are expressed as percentages of the baseline values. Error bars represent ± 1 SE. P values are for comparisons of rates of change between the two groups.